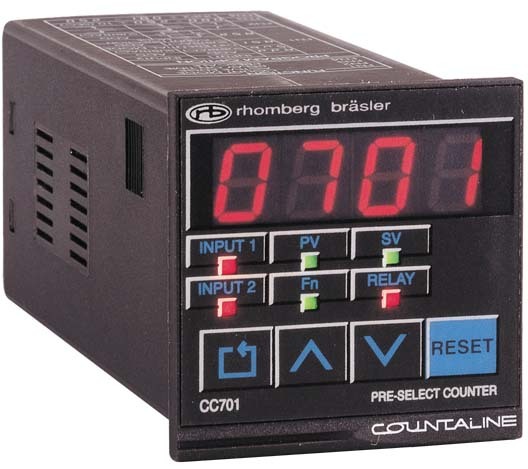 Rhomberg's compact range of counters cover most general applications including totalising and pre-select. (However, not suitable for use with high speed encoders). 48 x 72 mm panel mount housing format. Large 6-digit LED display with leading zero suppression. High speed count input (5kHz) with positive or negative active edge (ordering option). 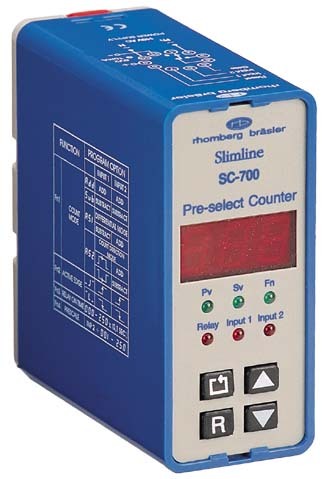 Independent low speed count input (30Hz). Both high & low speed can count simultaneously. 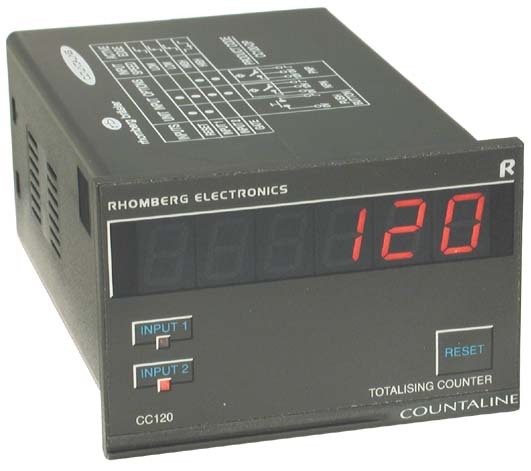 LED indication of both count inputs. Reset achieved via the front panel, via external switch or via NPN sensor. Gate Input for ignoring high speed count input pulses. DC (NPN/PNP) or Namur sensor compatible high speed and gate inputs (order option, but DC standard). Sensor leads can be connected directly as the CC-120 has an internal sensor power supply. 48 x 48 mm panel mount housing format. Large 4-digit LED display with leading zero suppression. Selectable ADD, SUBTRACT or ADD/SUBTRACT modes. Dividing prescale programmable from 1 to 250. Relay hold time programmable from 0.1 to 25.0 seconds. 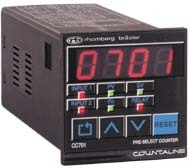 High speed count input (1kHz) with selectable positive or negative active edge. Connection of DC NPN/PNP sensors (or Namur sensors on request) directly to counter - sensor powered by counter. External reset input, or reset via front panel. Relay ON time programmable from 0.1 to 25.0 seconds. Gate Input and external reset input.